Take a good look at the newest Empire BT marker and you’ll see something familiar. If you’ve played COD or watched action movies then you already know all about the G36. We borrowed another page out of the H&K book to create a new look for the awesome Slice marker. A top carry rail with full Picatinny is perfect for adding a red dot to hit your target. The Front shroud has two more rails and a barrel that is APEX ready. 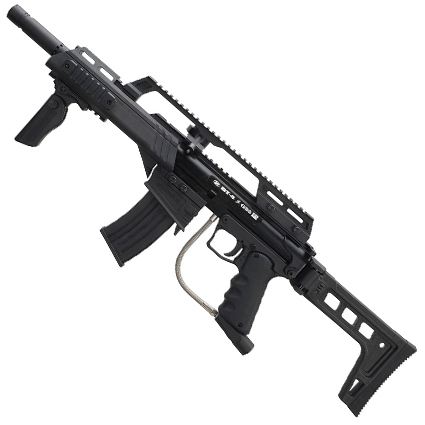 The folding stock is perfect for battles in tight spaces and the magazine rounds out the G36 look. The Slice feature allows the body to split without tools for easy maintenance and the Combat is well known for rugged performance. The Empire BT Slice G36 markers take our awesome Slice markers and give it a battlefield look, which is perfect for the woods or big scenario games.